Following its debut at the New York Auto Show in March this year, the comprehensively refreshed Kia Grand Sedona this week makes its local debut. With an upgraded exterior and interior, as well as enriched standard specification levels, the revised Grand Sedona line-up is poised to be the perfect companion to South African families. Originally launched at the New York Auto Show in April 2014, the Grand Sedona was designed jointly through the company's design centres in South Korea and California. Under the direction of Peter Schreyer, the designers threw stereotypical "minivan" approach out the window and instead looked to European crossover design trends to deliver a vehicle that was not only practical but also desirable. "And desirable it was. In 2015, it won the Korean Car of the Year Award and was added to Ward’s Auto ‘10 Best Interiors’ list. "More notably, the authoritative J.D. Power awarded it with an APEAL (Automotive Performance, Execution and Layout) Award – a feat it repeated in 2016, 2017 and 2018," says Gary Scott, CEO of Kia Motors South Africa. In South Africa, it was one of three Kia semi-finalists for the WesBank/SAGMJ Car of the Year competition and has been named CAR Magazine’s ‘Best Buy’ in the MPV segment in 2016, 2017 and 2018. For the 2019 model year, the Grand Sedona receives subtle updates to its already striking exterior design. A revised front bumper is complemented by an updated ‘tiger nose’ grille at the front, flanked by new, reconfigured headlamps and a new LED Daytime Running Light on higher specification models. At the rear, Grand Sedona also benefits from a new bumper design and a revised taillamp design, also with a new LED lighting signature on higher specification models. Inside, Grand Sedona remains a comfortable and luxurious space, with subtle upgrades to its interior including a redesigned fascia and a new graphics cluster. 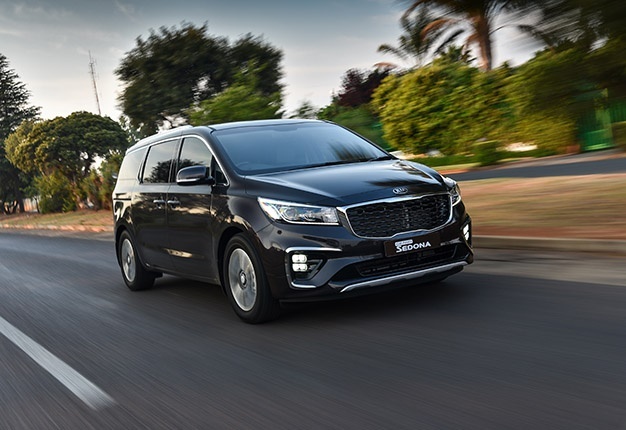 As part of the Grand Sedona’s mid-life enhancement, Kia SA has also revised the model line-up of the local range, discontinuing the SX specification grade and adding a new, feature-rich EX+ specification to the line-up. "The current Grand Sedona has been a respected companion to large families who value space, style and comfort since its launch in 2015. "Grand Sedona’s mid-life enhancement gave us an opportunity to further refine the product offering, based on valuable feedback gained from our customers over the past three years. "It has the stylish appearance that modern consumers appreciate, but now also benefits from a simplified range with enhanced specification across the board," says Stephen Crosse, Sales Director, Kia SA. The model also gains a new 7" touchscreen integrating audio controls and the rearview camera, as well as Apple CarPlay (the Grand Sedona is Android Auto ready). The steering wheel incorporates remote controls for audio and Bluetooth connectivity, with six speakers as standard. Seats are upholstered in grey fabric. EX models ship as standard with a 7-seat configuration, but an 11-seat option is available on special order for customers who require more seating capacity. 17" alloy wheels with 235/65 R17 tyres are standard. The new, higher-spec EX+ model sees an upgrade to automatic dual-zone air conditioning and auto-folding and heated side mirrors with integrated side indicators, and also gains an electrochromatic rearview mirror, front and rear park distance control, front fog lamps, glove box cooling, leather upholstery (as well as a leather-wrapped steering wheel and gear shift lever) and a wireless smartphone charger. The touchscreen is upgraded to a new 8" colour touchscreen with embedded Satellite Navigation, from which occupants can also control audio, whether it is a favourite radio station, via the USB/Aux jacks, or through their mobile device via Apple CarPlay (and Android Auto, once released in South Africa). Six speakers are standard. The new Grand Sedona EX+ is only available with a new 8-seat configuration, allowing more flexibility when an extra seat is needed. The range-topping Grand Sedona SXL is only available with a 7-seat configuration, and builds on the feature-rich EX+ grade by adding Smart Entry with Push Button Start, Blind Spot Detection, a dual sunroof, LED headlamps with automatic levelling, LED fog lamps, LED rear combination lights, a Smart Power Tailgate, dual electric sliding doors, electrically adjustable driver and front passenger seats (adjustable eight ways, including memory function and 4-way lumbar adjustment), rear seat warmers and an extra two speakers. Previously also available with a 3.3-litre V6 petrol engine, KIA has retained only the popular 2.2-litre 'R' turbodiesel engine, loved for its excellent mid- and low-range torque, for the enhanced Grand Sedona. The smooth and efficient engine produces 147kW of power at 3 800r/min, with maximum torque of 440Nm available between 1 750 and 2 750r/min. The engine delivers greater fuel economy, performance and engine response while reducing engine noise. It reaches 100km/h in 13.6 seconds, with a top speed of 190km/h. It also features an exhaust gas recirculation cooler to promote recirculation of clean, cold, low-pressure exhaust gas that reduces nitrogen oxide emissions and improves fuel efficiency. Finally, a newly adopted electronic swirl control valve in the intake manifold further reduces emissions by more carefully controlling the intake of oxygen to the combustion chamber. CO2 emissions are pegged at 208 g/km. Notably, the enhanced Grand Sedona, like the Sorento SUV, benefits from the inclusion of KIA’s new eight-speed automatic transmission across the range. The transmission boasts 143 newly-patented technologies and delivers a slick-shifting, more decisive drive while reducing emissions. Compared to other automatic transmissions, KIA’s new eight-speed unit requires fewer control valves, enabling a more direct mechanical link to the engine. This allows the transmission to shift more quickly than the outgoing six-speed automatic transmission and enables more decisive acceleration. It also features a full complement of safety and driver assistance systems, including ABS brakes with Electronic Brake-force Distribution (EBD), six airbags and ISOFIX child seat anchors. The all-electric windows also have a safety function that automatically halts the window closing if an obstruction – like a child’s hand – is detected. Drivers will also benefit from Electronic Stability Control (ESC) and Hill-start Assist, while all models feature Park Distance Control at the rear, linked to a reverse camera displayed on the 8-inch colour touchscreen. EX+ and SXL models also gain front parking distance control. All models ship as standard with Kia’s industry-leading unlimited kilometre, five-year warranty, as well as a standard 5-year/100 000km service plan and 5-years of roadside assistance. "Some of the core reasons our customers love the Grand Sedona is not only its style and its practicality, but also the raised driving position and its car-like dynamics. "The enhanced Grand Sedona range retains all of those outstanding characteristics, but now brings even more flexibility to its award-winning cabin with the addition of an 8-seat derivative, and an even better drive thanks to the new 8-speed automatic transmission," adds Crosse.